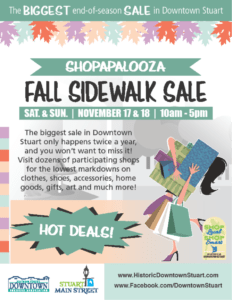 Savvy shoppers will find outstanding values this weekend as Downtown Stuart merchants clear out their summer and fall merchandise at the annual fall Shopapalooza Sidewalk Sale. Get a head start on your holiday shopping, or snag that one-of-a-kind item you’ve had your eye on at this unique outdoor sale. Head downtown for end of season, clearance, and special sale items, Saturday and Sunday November 17 & 18 only.